THE TEMPLE AT MELKOTE THE TEMPLE AT MELKOTE - Shiva Maha Purana, Vishnu Purana, garuda purana, bhavishya purana, skanda purana. level and overlooking the Tirumalasagara and the Cauvery valley, it is a great centre of pilgrimage. From time immemorial, this hill is known by various names such as Yadavagiri and Yadushaila. It is believed that seven sacred ‘kshetras’ are comprised at this place – Varaha, Narasimhagiri, Seetharanya, Pancha Bhagavata, Thakshya, Nayana and Vaikuntha Varshana. In addition, the place has been sanctified by seven sacred ‘theerthas’ – Vaikuntha Gange, Narayana, Palasha, Parashara, Darbha, Veda- pushkarini, and Padma. The devout Vaishnavas consider Melkote as the Badarikashrama of the South. The great Vaishnava Acharya Ramanuja enriched its heritage by residing here for twelve years. According to legend, ‘Tirumannu’, the sacred white clay used by Sri Vaishnavas to adorn their foreheads was brought by Garuda from Swetah Dweepa in ‘Ksheera Kshetra’ to Melkote, where it is found in plenty. The town with its ruined ancient palace, the fort walls with the wild creepers, the unfinished gateway and many such places give a glimpse into the past history to the visitors. This place was also called Tirunarayanapuram after the main deity, and Yadavagiri after the Mysore Yadava rulers who built the fortifications. According to mythological tradition, it is mentioned that Lord Krishna and Balarama offered prayers at this shrine and presented to it the diamond crown which once adorned Maha Vishnu and was stolen by the demon Virochana. Historically, not much is known before the advent of Ramanuja. Only after his sojourn did the place gained importance. In the 14th century, Melkote had to face invasion by Muslims when Dorasamudra was wrecked and finally Timmanna Danayaka, the chieftain of Nagamangala, restored the past glory in the year 1460 A.D. Again, the place was plundered by the Mahrattas in 1771 A.D., after the defeat of Haidar Ali at Chinkurli and the huge wooden chariot of the temple was burnt. Owing to the patronage of the successive rulers of Mysore, Melkote could withstand the invasion and plunder and regain its original glory. Sri Ramanujacharya, after his successful tour of North India could finish his ‘Sri Bhashya’, the commentary on the Brahma Sutras, with the assistance of Kuresha. It is said that the Acharya took shelter at Melkote after staying for some time at a nearby place called Thondanur. This small village has made name in the history as the Acharya stayed here for some time before finally proceeding to Melkote. Sri Ramanuj acharya strived very hard to renovate the l emple with the help of the Hoysala king. In all these exploits, t he Acharya was ably assisted by his disciples and the l’anchanamas of the locality. As token of appreciation of I heir services in restoring the temple, they were granted permission to enter the temple and bathe in the sacred tank on certain occasions and given the title of ‘Tirukulattar’ meaning ‘people of the noble descent’. The temple at Melkote is dedicated to Lord Narayana, popularly called as ‘Cheluva Narayana’. The processional idol of the deity is called ‘Cheluvapilleraya’. With the help of I he Hoysala King Vishnuvardhana, Ramanuja was able to rebuild the ancient temple. As it stands today, the temple is a big square building and the architecture is very simple. The other important temple is that of Narasimha on the top of a hillock. The shrine is approached by climbing over about 400 steps from the bottom. This temple was built by Raja Wadeyar of Mysore in 1600 A.D. The temple is a small structure and the architecture is a combination of Hoysala and Dravida. The tower is very imposing and dominates the surrounding plains. Those who are unable to climb to the top, worship the foot imprints of Lord Narasimha at the foot of the hill. The Kalyani tank at the foot of the Narasimha hill was built by one Bachappa, and later restored by the Mysore kings. The steps were constructed at the instance of Rani Muddarajammanni. The pillared corridors serve as resting places for pilgrims. The Swamiji of Parakala Mutt has established a centre at Melkote. The Yatiraj Library at Melkote is a treasure-house of fine unpublished manuscripts on various subjects. The founder of Ahobila Mutt, Satagopa Jeeyar was said to have horn at Melkote in 1378 A.D. The Sanskrit Vedic College established more than a century ago, is one of the oldest institutions in India. The Maharajas of Mysore were great devotees of Cheluvanarayana and patrons of Yathiraja mutt. They have presented valuable gold ornaments including a diamond crown to the deity. Their service to this sacred place began in the 16th century and even to the last days of their reign they helped the temple in many ways. Raja Wadeyar presented a gold crown, known as Rajamudi. The Vairamudi, a diamond studded crown, believed to have been presented by Garuda to Cheluvanarayana after a search of the divine places for one deserving the crown, is an invaluable ornament. During the annual festivals in March – April the two crowns adorn the Lord on different days, popularly called Rajamudi Utsava and Vairamudi Utsava. Thousands of visitors and devotees flock to the place during these two festivities. The Vairamudi procession symbolises the fulfilment of the desire of Dasaratha to perform the coronation of Sri Rama which could not be performed by him during his life time. Melkote is of importance not only to the Hindus but to the Jains and Muslims as well. It was the Hoysala king Vishnuvardhana who renovated this place of pilgrimage in l lie 11th century at the time of Ramanujacharya. Queen Shantala Devi, wife of the King struck a compromise between I he Hindu and Jain faiths. The inscription at Shravanabelagola even today indicate cordiality and affinity between the Hindus and the Jains. There is a historic incident praised eloquently in the folklore of Kannada literature, associated with the Utsava murthy of Cheluvapilleraya. 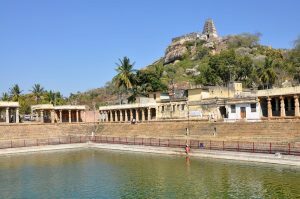 Before the 11th century in one of the invasions from the north, Melkote became a scene of war and the image was carried away to Delhi by the invaders, it is stated that the Delhi princess Varanadi used to sport at nights with the image of Cheluva. Ramanujacharya went to Delhi and brought the idol beck to Melkote. Unable to bear the separation, the Muslim princess rode westwards to Melkote along with the Acharya and was seen absorbed into the Lord. The main idol of Cheluvanarayana in the ‘sanctum’ has a smaller idol installed at its feet, and this has a very interesting legend behind it. This small idol is said to represent the Mughal princess as ‘Bibi Nachiyar’. Regular worship is done to this idol along with the main deity. Tippu Sultan, too, presented many gold ornaments to the temple and elephants for the use of the head of the mutt. Mummadi Krishnaraja Wadeyar and his Queen have contributed considerable help for the development of this temple. Melkote is a small peaceful and neat town populated by Sri Vaishnava families. A few families are engaged in cotton and silk weaving from a long time. The place is famous for its fine and excellent weaving. The cotton ‘dhoties’ of Melkote are famous throughout the country. Melkote is only 45 kms. from Mysore and is connected by an excellent transport system. The place can be reached from Bangalore also directly. A number of buses operate in the route to Melkote from many other parts of the state. There is a small rest house in the town and a number of choultries and Dharmashalas for the convenience of the pilgrims and visitors.